ARE YOU PLACING YOUR CONFIDENCE IN THE INTEGRITY OF THE FAKER? We are pleased to offer this service to the discriminating collector or dealer. Each authentication letter relates the subject revolver's serial number to the data in our survey, provides a historical analysis of its probable unit of issue/service, summarizes unique or noteworthy features and lists replacement parts - noting any attempts at "faking." We estimate that almost 90% of Colt SAA Cavalry & Artillery revolvers currently being offered for sale, especially at shows - have been faked or "helped" in some way. Don't you get fooled! Ask for a money - back guarantee of authenticity - make sure all exceptions are disclosed and explained. Make provision of an authentication letter as condition of the sale. Protect your valuable investment - always get an authentication letter before buying! 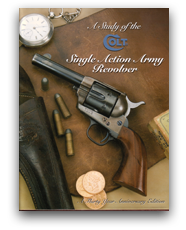 We can now become your intermediate "agent" when buying or selling a U.S. issued Colt Single Action revolver. HOW IT WORKS: After the seller has received the funds for both the purchase price and shipping charges, he may then send the revolver directly to us for authentication. (Make sure you have received a money-back guarantee if the revolver is proved not to be as represented). After the revolver is received and analyzed, we will phone the proposed buyer and advise him of our findings. If the revolver's condition is acceptable to the buyer, we can then send it on to him together with our formal "Letter of Authentication." If in-turn the revolver fails to meet the buyer's expectations, we will upon instruction, return the revolver to the seller. (Our fees must be received prior to shipment). FEES: Our fees remain the same regardless whether we do or do not execute a formal "Letter of Authentication." After all, you the buyer may have saved yourself a bundle of cash and /or a considerable amount of "grief," for just a fractional amount of what this transaction may have cost. We are beginning to be cognizant of shortfalls with a few of the military Single Actions being offered by some auction houses. Although many of these descriptions follow the same pattern which would be used for a legitimate revolver, these descriptions could equally apply to either an original revolver or one that has been "restored." So... BE CAREFUL! Insist on a letter of authentication. There is currently no marking found today on these revolvers which is not being duplicated. This includes ALL barrel addresses, Ordnance inspector's marks and their cartouches. He may not necessarily be a reputable dealer or has had a sad experience in authenticating a previous revolver. He knows something about the revolver he is not divulging. He may be aware of a previously supplied "Letter of Authentication" being written about this revolver, a letter which has now "conveniently" disappeared! WARNING! Do not under any circumstances accept a "three-day" inspection. This could be a trap! Allow 2 to 3 weeks for inspection and return. Because we have written over 2500 letters of authentication since the early 1980's there may be a chance that we have written a letter about the revolver in question. In this event, we insist that the revolver be re-examined because in many cases these revolvers may have been "improved" since our last examination. We cannot however discuss confidential information regarding previously authenticated revolvers. Note: We do not authenticate revolvers from photographs! GOLD SEAL LETTERS: We have recently initiated our "Gold-Seal Letter of Authentication." A revolver which is found to be authentic in every respect, regardless of the percent of original finish remaining, may be awarded our "Gold-Seal" letter. This revolver is one which the writer feels would qualify being in his own personal collection: one for which "no excuses" would ever be required. Few surviving examples will qualify for this distinction. SILVER SEAL LETTERS: This new classification has been recently initiated because of a necessity that arose. Some revolvers were just not the condition that would have warranted a "Gold Seal" letter, but in reality, were nice, honest examples worthy of any collection. So, now we can award these extra-nice conditions revolvers with our "Silver Seal" letter of authentication. NOTE: The above "SEAL" letters are awarded solely at the discretion of Mr. Kopec. Questions about shipping? We often hear the comment; "Do we have to ship you our revolver?" Or "We would never consider shipping our revolver." Well folks, Hundreds of people have sent us their prized revolver via REGISTERED MAIL, and we have seldom experienced problems. The U.S. Postal service assures us that this is the safest way to ship valuables. Our local Postal Inspector advised us that many shipments of gold, diamonds, currency and securities are shipped by Registered Mail. Registered Mail must be signed in and out of every station and has its own tracking system. Yes, it does take longer than regular Priority Mail, but you sacrifice some speed for absolute security. COLT FACTORY HISTORICAL LETTERS: The Colt Archives Department cannot supply letters on Cavalry revolvers below serial #30,600. They may however have information about an Artillery revolver with a frame serial number below this number. 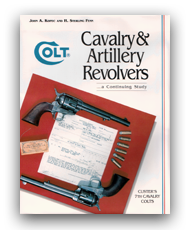 We highly recommend that you obtain a Colt factory historical letter on your Cavalry or Artillery revolver. They may be reached at (860) 236-6311, Ext: 1343. Ask for Beverly Haynes or assistant. TIME INTERVAL: We are often asked, how long do you keep the revolver? Normally, we like to have about one week to research and authenticate your revolver. Allow another six or more days for return via Registered Mail. Finally: Don't be discouraged, there are some great Cavalry and Artillery revolvers surfacing out of estates and families on a regular basis. Maybe you'll find the next one! WE ARE ALWAYS INTERESTED IN PURCHASING YOUR HISTORICALLY CORRECT U.S. CAVALRY REVOLVERS... WE ARE PARTICULARY INTERESTED IN OLD FAMILY REVOLVERS WHICH HAVE BEEN PASSED DOWN THROUGH THE GENERATIONS. CALL US ABOUT YOUR REVOLVER. WE WILL BE HAPPY TO DISCUSS YOUR INDIVIDUAL SITUATION. Fed-Ex or U.P.S. SHIPMENTS: we will be pleased to return your revolver by either of these carriers if you can supply us with your account number on a prepaid waybill. In order to property expedite your Authentication Letter, it is imperative that you call us prior to sending your revolver (530) 222-4440. Plus: $17.50 per revolver for return REGISTERED MAIL (return receipt). "Allow six working days for delivery"
$46.30 every $1,000.00 increment over this $25,000.00 value. NOTE: Because these revolvers are classified as ANTIQUES (pre 1898 mfg.) per US code, they may be legally shipped between unlicensed individuals via US mail. To avoid any problems however, you need not disclose the contents of your package, nor even write "ANTIQUE" on the box. IMPORTANT: Pack your revolver in a MEDIUM FLAT-RATE PRIORITY box (#0-FRB2). Seal all seams with gummed paper tape. NOTE: Two revolvers may be shipped together using the LARGE PRIORITY FLAT RATE box. Add $23.00 for return shipping if the large box is desired. IN A HURRY? We have recently experienced excellent results with the USPS Express Mail Service. Overnight delivery in most cases. Traceable tracking. Insurance is however optional in either direction. Allow $65.00 per revolver for return EXPRESS MAIL services. (without insurance). *Note we no longer offer appraisals.